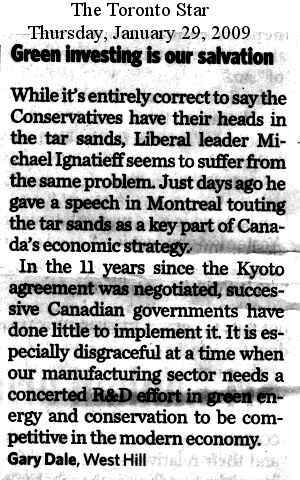 While it's entirely correct to paint the Conservatives as having their heads stuck in the Tar Sands, Liberal leader Michael Ignatieff seems to suffer from the same problem. It was mere days ago that he gave a speech in Montreal touting the tar sands as a key part of Canada's economic strategy. In the 11 years since the Kyoto agreement was negotiated, successive Canadian governments have done little to implement it. While this would be disgraceful at any time, it is particularly disheartening when Canada's manufacturing sector needs a concerted R&D effort in green energy and conservation to be competitive in the modern economy.